The seeds of a growing business. At First Security Bank, we understand agriculture because that’s where we started. Many of our branches are located in the heart of Ag country, and Ag lending is the cornerstone to our business. We realize the importance of agriculture in our region and we have made a commitment to doing what it takes to be a premier Ag lender. So ask a First Security Bank loan officer about our operating lines of credit, equipment loans, or our farm real estate loans just to name a few. We hope you will turn to a bank that understands and promotes keeping agriculture and rural America strong! Our offices specialize in the following. Operating Lines of Credit – Your cash flow needs can be met with a line of credit to give you the flexibility and freedom you need. 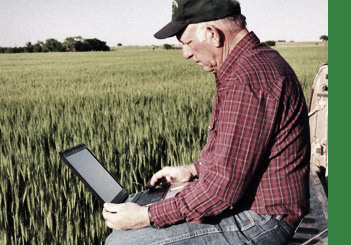 This allows access to funds at any time to keep your Ag operations going strong. Livestock loans – First Security Bank offers loans for Production livestock, Market livestock and Livestock Facilities. These loans can include purchase and feeding expenses for production and market livestock. Also construction and permanent financing of buildings and equipment. Machinery and Equipment Loans – We offer very competitive loan rates ranging from two to five years. Fixed and Variable rates are available and our lenders will work out a convenient repayment plan to best suit your cash flow objectives. Ag Real Estate loans – Whether you are looking at land purchases, building expansions and improvements, or refinancing, First Security Bank is here with the long-term financing you need. Our loan packages include competitive fixed and variable rate loans amortized up to 20 years. First Security Bank also participates in various programs designed to assist in financing beginning and small farmers. Our seasoned Ag lending will help tailor the loan package to meet the needs of each Ag producer. Government Programs – First Security Bank participates in various government programs at both the national and state level. These include FSA and RFA loan programs. Some of these loan types include Beginning Farmer loan programs as well as conservation programs such as livestock facility and equipment improvements. Ask your local branch about which program may be right for you. These are just a few of the products offered by our First Security Bank offices. Let our experienced staff and competitive interest rates help your operation flourish. Stop by one of our offices today to see what our lenders can do for you!